N651SH is actually a modified Ejército del Aire or Spanish Air Force C.6 or Cazabombardero 6. That means "fighter bomber 6" in English. The training versions of the T-6 were E.16 or Enseñanza 16. That means “training 16” in English. N651SH was C.6-168 after modification for Spain. In her final active duty assignment she was with 421 Escuadrón and marked as 421-59. 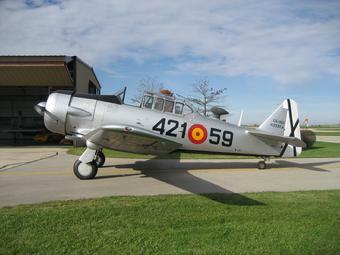 For full details on the T-6 Texan in Spanish service refer to "Aeroplano, No 24, 2006" in the references section. N651SH :1949 North American T-6D Texan "Dulcinea"
Our T-6D Texan, “Dulcinea”, was originally built during World War II as an advanced trainer for the Army Air Force pilots who became the famous fighter and bomber pilots that won the war. During the early days of the Cold War, it was recognized that a fresh generation of pilots would have to be trained for the newly independent U.S. Air Force. The Air Force contracted with North American Aviation, who originally built the aircraft, to reopen a production line and completely rebuild the T-6 Texan with new systems and radios which included our airplane in 1949. After completing duty at Goodfellow AFB during and after the Korean War, the Air Force released our T-6 aircraft for export to allies and other friendly nations. Our T-6 was once again overhauled and exported to Spain in 1962. In the early 1980s as Spain retired the T-6 aircraft type from active service a small number of the aircraft in best condition were held in reserve for museums. Our T-6 was one of the last to be released and is in authentic markings of the last Spanish squadron in which she served. The cockpit still has the bomb, rocket, and machine gun arming switches from her combat role. Modern radios, navigation, and transponder equipment have been added for flight safety in today’s airspace. Why the name “Dulcinea?” Look in FAQ! 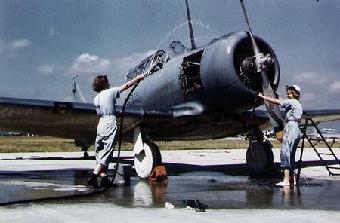 (c.1943) WAVES washing a SNJ training plane at NAS Jacksonville, Fla.
History of the T-6 "Texan"
During 1946, the Canadian Car and Foundry company developed the Harvard Mk IV trainer to the specifications of the T-6G and produced 285 T-6Js under the same design for the USAF Mutual Aid Program. Designated the T-6G, the Texan saw major improvements in increased fuel capacity, an improved cockpit layout, as well as a steerable tailwheel. 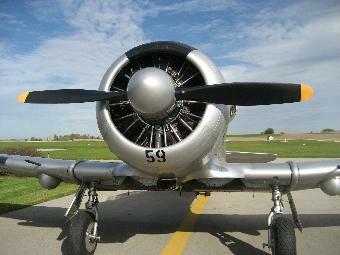 U.S. Air Force and U.S. Navy forces in the Korean War modified the Texan under the LT-6G designation and employed it in combat for forward air control of propeller and jet powered strike aircraft. Spain utilized the armed T-6 in combat during the Sahara conflict for patrol and counter-insurgency operations. France made extensive combat use of armed T-6 aircraft during the Algerian conflict. Weight: Empty 4,158 lbs., Max Takeoff 5,300 lbs. Dulcinea's T6 engine "up close!"